We are pleased to provide our patients with affordable and flexible finance options. Treatment finance enables you to take advantage of all dental procedures including aesthetic, cosmetic, restorative, orthodontic and implant treatments. Below you'll find answers to the questions we are most commonly asked about our treatment finance options. The practice staff can discuss the options available to you. By using the latest on-line technology you can apply in practice or from home. You will need to be over 18, a UK resident for more than 3 yrs and finance is "subject to status". What types of treatment can I use it for? Most of the treatments that we offer here are available on finance. Our team will be happy to discuss the options available to you for your specific treatment. How much can I put on finance? 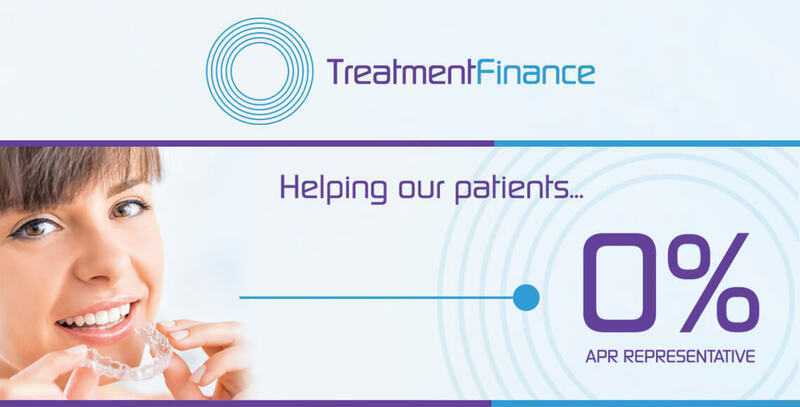 You can apply for treatment finance for procedures ranging from £250 - £25,000. You can also apply for finance for subsequent courses of treatment if needed at a later date. Will I have to pay any additional fees? With interest free credit, there are no hidden costs - you will only pay for the cost of your treatment. What finance terms are available? Our practice offers a number of different options and together we can choose the option that best suits your specific needs. Payments will be collected monthly by Direct Debit and will start one month after the loan agreement has been signed. The application process is quick and simple and you will receive a prompt response upon completion of the online application. Your treatment can start as soon as agreed with the practice. Can I change my mind about the finance? Yes, there is a 14-day 'cooling-off' period, after signing the finance agreement if you change your mind. The application process is quick and simple enabling you to start your treatment without delay. Caspian Health t/as Apex Dental Surgery with the registered office at 923 Finchley Road, London, NW11 7PE, company number 07273626. Credit is provided by Shawbrook Bank Ltd who are authorised and regulated by the Financial Conduct Authority. We do not act for or represent Shawbrook Bank Ltd. Approval for credit is subject to status. Loans provided for no more than 12 months with 12 or fewer payments are exempt agreements. We only provide introductions for exempt credit agreements and are not authorised by the Financial Conduct Authority.